Everyone, I'd like you to meet Pumbaa. 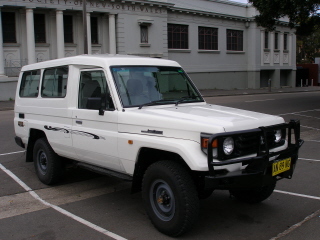 We bought her in October 2007 after selling our trusted 1998 Toyota Dual Cab Hilux(3.0 liter diesel) which took us around Australia. It was a bit of a search to find one here in Sydney, but we eventually did find one is a small town about 400km north of here. You don't really get any more basic than this, do you? 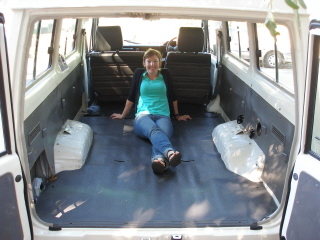 When we bought her, she had the bench-style seats in the back. We very quickly got rid of that though to make way for our luxury penthouse. As you can see from the picture, Mandy won't really have a problem fitting in. Jacques on the other hand is a bit taller, coming in at 6 foot 1". Mmmm, cosy!!!! We will make sure to update the photo album with photos of Pumbaa once all the work is done. Being tall isn't all that bad, as Mandy found out after we replaced the suspension. One of the important aspects of having a capable vehicle is of course to have good ground clearance. 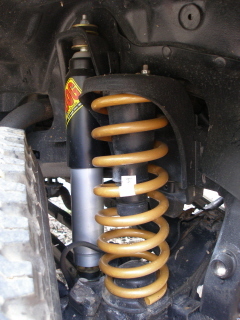 We achieved this when we replaced the standard suspension with Tough Dog suspension springs and shocks. Our tyres will remain the same size (diameter wise), but a bit wider, so we won't get any more ground clearance there. Still to be replaced is the standard split rims (also known as cheesecutters) on Pumbaa, with steel rims and new more aggressive tyres. I've been debating about tyre choice for so long now that it's not actually funny anymore, but more about that later on. Some of the additions you can see here is the Safari snorkel to keep the dust and water out of the filters and engine. 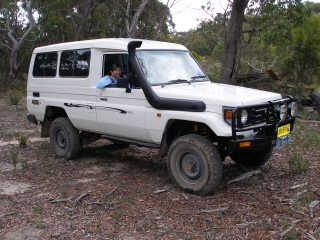 you can also see the additions of our Roo Lites for night driving and then of course the all important winch. Hey, who's hiding in there?? This was again one of those choices that took forever. Getting the right combination and more importantly getting something that is reliable is quite a task. Everyone have their own opinions and experiences with different brands they've tried and tested. In the end though, it is still up to you to come to your own conclusions. So after wearing out my thinking cap, we opted for the Tough Dog Big Bore 45mm adjustable shock and the heavy duty springs for the front and heavy duty leafspring set-up for the back. You can read more about the Tough Dog products by clicking on the photo. What is that... I hear you ask!!! This is the diff lock we fitted to the rear. 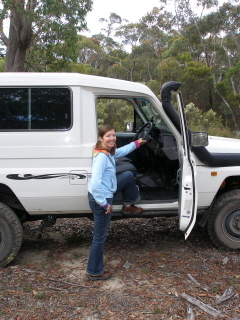 Whenever people talk about diff locks (in Australia that is), the first thing that springs to mind is a ARB air locker. They are definitely good products (can you here the but coming? ), but again more things to possibly go wrong with the airlines etc compared to this little baby here. This is a Detroit "No-Spin' diff lock. It is there the whole time. You don't have to think about switching on an air compressor for the air locker and trying to decide if you need it or not. If you are in a situation where you think you might need a diff lock, then the Detroit locker is already working. I believe these are very popular with a lot of armies as well because of its capability and robustness. Click on the picture to learn more about the Detroit Lockers. Well, hopefully. 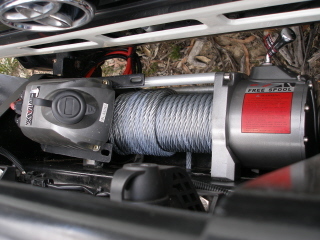 This is our new T-Max 10000 lbs winch. It has a 6.6 hp motor, so it should be able to do the thing with a fully laden vehicle. It comes with a remote which can connect to the winch with a cable, but you can also use the remote without the cable to make it a bit safer. 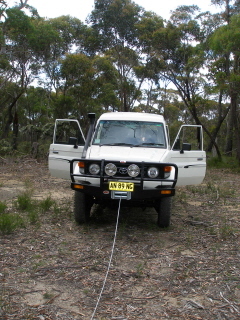 Winching is one of the most dangerous recovery techniques, so safety should always be the first consideration. Click on the picture to learn more about T-Max products. trunk protector like this one. 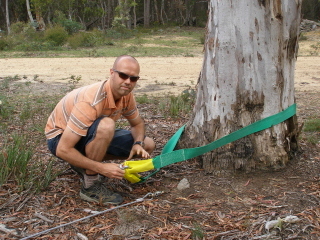 This will limit any cable damage to the tree and will also protect the cable. Just make sure the tree is a strong enough anchor point for the recovery, and that it's not rotten on the inside. Ready to try out the winch for the first time in a safe (i.e flat surface and not a real recovery) situation. Have a look at the Planning folder to see more photos of our new home.